Is Intuitive Eating What You’ve Been Looking For? When I found recovery, I swapped binging on alcohol and drugs to binging on carbohydrates. Cake, biscuits, scones, bread, and anything else that was sugary, dense, and made my feelings go away (albeit temporarily) was all I became interested in. I spent many hours obsessing about what I’d buy on the way home from work. Sometimes I even left early to binge. Living like that was not the recovery that I wanted. I was miserable and bloated, and I treated my body terribly. It took the next six years to retrain those eating habits, ditch my scale, lose weight, and rewire my brain to like nourishing foods. I wasn’t satisfied with the explanation that I was addicted to sugar, so I got a nutrition qualification and learned a lot about the physiology of a brain with substance use disorder—specifically, what makes that type of brain primed to turn to highly rewarding foods for a long time after quitting drugs and alcohol. I was then introduced to intuitive eating by Tiffany Thoen, registered nurse (RN) and integrative coach. She had me at the words, “I give myself permission to eat.” Once I let those words sink in and I had time to explore the concept, I felt my entire body relax. Keen to find out more, I interviewed Coach Tiffany. As an RN and integrative coach, Tiffany helps women who are tired of struggling with food. Her clients learn to nourish themselves so they can feel good and have the energy to do what they want to do. Tiffany’s background as an RN uniquely qualifies her to support clients on a wide spectrum of health and wellness areas and allows her to develop customized holistic plans based upon an individual’s unique needs. Tiffany’s passion is helping women stop having their energy drained by the food struggle and start having the energy they need to be powerful leaders in the world. Tiffany furthered her training as an RN in the integrative nurse coaching program and is certified in intuitive eating. She is also a grateful member of the recovery community. She is 20 years sober and feels that her recovery has informed all areas of her life, especially her work as a nurse and a coach. Liv: In your experience, what are some of the common food-related issues people in recovery face? Tiffany: Many people experience an increase in food challenges in early recovery, and that can become a long-term struggle. We [people in recovery] don’t usually experience food as a way to care for ourselves but as another way to numb out or as an afterthought. Many people in recovery tend to neglect feeding themselves, forgetting to make their hunger a priority during the day or for periods of time. They then experience a pendulum swing and eat in a way that feels out of control. When this happens, they experience self-judgement and shame around food. There are many reasons for those patterns. Using substances causes us to be less connected to our bodies. Many people are using drugs and alcohol to numb untreated trauma. When we get sober, it can feel painful to be in our bodies, so we often are still looking for ways to numb. Food is an easily accessible way to do that. People in recovery also often have low dopamine tone—they often use food to increase dopamine. Stress and fatigue cause increased desire for sugar and carbs as well. Additionally, in early recovery many people are also nutrient deficient, which can lead to cravings. Liv: What is your opinion on sugar addiction? Tiffany: When people talk about sugar addiction, they are referring to eating in a way that feels out of control or having cravings. This is their experience, and I know that is real for many people. I have experienced it myself. There are several reasons for this type of eating—it doesn’t necessarily mean the person has an addiction. In terms of the science, the jury is still out. But we are beginning to see that there are various reasons for an increased desire for sugar, including the type and number of bacteria in your gut. Also, restricting sugar causes an increased desire and actually causes it to taste better when you do eat it. 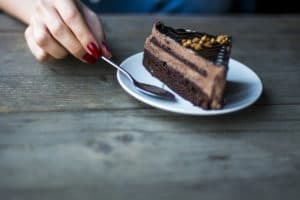 If you have been attempting to control and restrict sugar, you will likely eventually eat it in a way that feels out of control. Typically, when people think they are addicted to sugar, they think it is the same as substance abuse. However, the science is beginning to show that while sugar does light up your pleasure pathways like cocaine, it does not hijack your neuro-biology the same way that cocaine does. Many other things light up our pleasure pathways, such as hugs, walking in nature, and babies laughing, but again, they don’t hijack our neuro-biology. For more information about sugar’s effects on the brain, listen to registered dietician Marci Evans’s great exploration of this topic on the podcast Do No Harm. Lastly, one of the reasons it is problematic to think of sugar addiction as the same as a substance use disorder is that typically the only solution is thought to be to abstain. But as I mentioned, if you restrict sugar, you will likely increase your desire for it and then eat it in a way that feels out of control. This leads to feeling more shame around food. Studies show that shame actually makes people more likely to binge eat. Liv: You’re a proponent of intuitive eating. Can you explain a little more about the concept/principles? Tiffany: Intuitive eating is about healing our relationship with food. This process is done using the 10 principles of intuitive eating developed by a pair of registered dietitians, Elyse Resch and Evelyn Tribole, over 25 years ago. It has helped me to finally heal my own relationship with food after lifelong dieting. 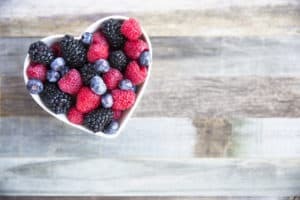 I am so passionate about it that I became certified as an intuitive eating counselor and now exclusively do this work in my coaching practice. At the core of intuitive eating is having satisfaction in our relationship with food (yes, eating food we actually enjoy! ), making our hunger a priority, letting go of judgement, and getting more in tune with what our body wants and needs. Liv: What steps could we take to eat more intuitively? Second, let go of judgement and shame around food and your body. This can be very challenging, but it allows for curiosity and, in turn, for exploring what your body’s signals are and what those signals mean. Third, ask yourself regularly: What am I feeling? What do I need? Then practice addressing those needs. Liv: What are the benefits of being more in tune with your body? In what ways might we identify bodily cues? The more we know what our bodies are signaling and the more time we spend in our bodies, the more we are able to address those signals/needs. This also leads to an increase desire and ability to respect and honor our bodies. Studies show that people who have higher body attunement eat more intuitively. Some additional ways to begin getting more connected to your body include deep breathing, meditation, yoga, gentle movement, and mindfulness practices. Addressing any underlying trauma and pain issues that prevent you from being comfortable in your body will be extremely helpful in healing your relationship with food. Letting go of judgement and approaching your relationship with food and your body with a mindset of curiosity is a critical foundation to this work. Finally, practice eating mindfully, which means eating without distraction and focusing on the taste, flavor, and enjoyment of your food. Mindful eating makes it much easier to honor your fullness. Another great tool is the hunger scale, which you can check out on my website. For more information about Tiffany, you can visit her website or join her Facebook Group, Deserving Women.